You have 19 days. When Kentucky travels to (don’t call me Papa John’s) Cardinal Stadium you should do your best to be there. UK fans are experiencing one of the best seasons in program history while UofL fans are begging for Bobby Petrino to be fired. 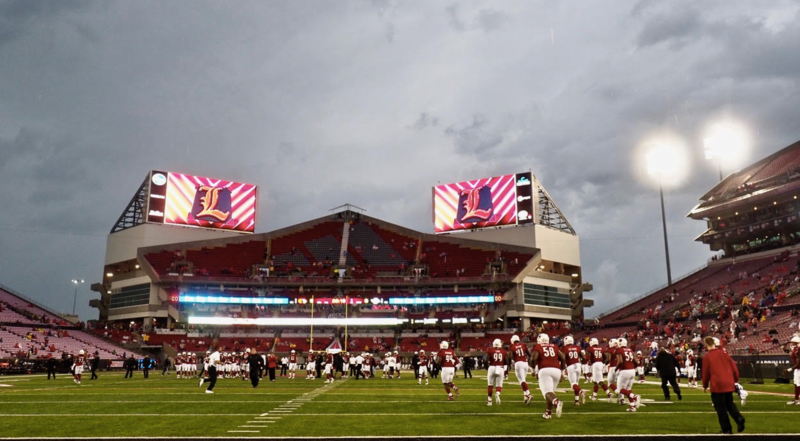 It’s the perfect storm for Kentucky fans to outnumber UofL fans at their stadium on Nov. 24th. Yes, I hope UK fans pack Knoxville this weekend and Kroger Field needs to be packed for Senior Day the following Saturday, but it’s never too early to plan ahead. Every team in the country fudges attendance numbers so when UofL was announcing an average of nearly 51,000 for the Cards’ first four home games it didn’t take a genius to realize that wasn’t accurate. The Courier Journal reported the average number of tickets scanned was actually 34,968. UofL has played one home game (Wake Forest) since that report and seeing the pictures from that game it’s clear the average has dipped closer to 30,000. Not the best time for UofL to bust open their (beautiful) expansion, which closed the horseshoe. But UofL’s loss(es) and idiotic “Build it and they will come” attitude is Kentucky’s gain. With Louisville fans looking to do anything else on Saturday UK fans have a chance to show up in historic numbers at Cardinal Stadium. And they should. You should. UofL’s football program won’t be down forever, and if the Cards do fire Petrino and are able to lure Jeff Brohm back home our rival fans will be in heaven. Louisville (whose recruiting class is crumbling) will rebound quickly with recruits across the state and region. UK doesn’t look to be taking a step back anytime soon, so no one in Lexington is scared, but why not take a moment to capitalize on a picture perfect moment in 19 days? Travel to Cardinal Stadium and outnumber UofL fans in their own building. Besides having the ultimate troll stuff like this help recruiting and the program. Louisville may someday get better, but pictures last forever. Kentucky has the fans to do it and there are a plethora of tickets available for cheap. You can click HERE to look at ticketing options. $40 to get in the door? You don’t often even see those prices at Kroger Field. Get your family and friends and make the road trip. Plus, if the Cards do keep Petrino until the end of the season you will want to see this beatdown first hand. This may be the last Petrino vs. Kentucky game and his last game at Cardinal Stadium. Let’s make sure to send him out the right way. Buy the $40 tickets and sit where you want, their will be PLENTY of open seats!!! He’ll just move to the lower level after the first quarter!!! We got ours in sec 3. Have no idea how bad they are , hope it’s a blue section and we will enjoy a W.
My dad and I will be there with you in Section 3! Loud and proud wearing lots of blue. I’ve heard there are no bad seats even in the upper level. The whole stadium will be a blue section. We don’t even go to our home games, you really think so called UK fans will fill their stadium. Was a joke how many UGA fans were there Saturday, after watching it on tv it was worse than what I thought being there. Want to be a big time program you don’t let that many enemy fans in your stadium. I feel bad for our players looking across that stadium and staring at red/black all game. 60,000 may have been there but 20,000-25,000 were UGA fans, SAD and a disgrace by BBN. This is their biggest nightmare. They can’t afford to fire Petrino, I don’t think. Depending on when he gets fired, he could be owed up to $14 million, they had to pay Jurich $7 million, and Petino’s lawsuit for $35 million means that money is going to be put aside until the outcome of the case. That’s also not including all the lawyer fees, lost revenue to basketball and football due to terrible attendance, and probably trying to sort out the mess with the foundation and missing money. Papa John’s was taken off the stadium, so they lost that major sponsorship and pressure is mounting to renegotiate the Yum! Center deal.